The Fill and Stroke dialog has a Blur slider that when moved from zero, creates and attaches a Gaussian Blur filter to selected objects. If the slider is reset to zero, the filter is automatically removed and deleted. The same principle works on the Layers dialog where a choosing anything but Normal creates a Blend filter and attaches it to the Layer. Setting the drop-down menu back to Normal deletes the filter. Filters can also be removed from an object by using the menu entry Filters → Remove Filters. The Filter Effects dialog (Filters → Filter Editor...) is used to build complex Filters out of Filter primitives. 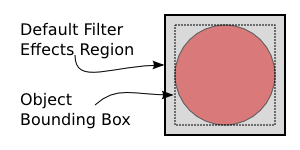 An example of a complex Filter is the “Drop-Shadow” filter. The dialog is also used to apply Filters to objects. Whenever an input to a Filter is specified to be Background Image or Background Alpha, the SVG file must include the “enableBackground” tag to tell the SVG renderer it must keep a copy of the background around. Inkscape does not add this tag for you except in the case of using the Layer dialog to add a blend. A work-around is to use the Layer dialog to temporarily add and then remove a Blend filter; this will leave the necessary tag in place.